Canadian multi-disciplinary artist Marian Wihak was born and raised in the city of Regina, in the great plains of South Central Saskatchewan, and lives and works in Toronto, Ontario. Originally trained in theatre design, and with a long-standing career as a film production designer, Marian is also a visual artist with an MFA in Interdisciplinary Art, Media and Design from OCADU. For many years the focus of her visual art practice has been creating evocative, large-scale oil paintings that chart nocturnal lightscapes both rural and urban, inner psychological landscapes, and dynamic weather systems. In recent years she also builds on her familiarity with and understanding of spatial responsiveness and metaphoric narrative, integrating her design and visual art practices to develop new possibilities in immersive and experiential environments. This serves her overarching interest in the overlapping perceptive and phenomenological aspects of chaos, the sublime and duration. 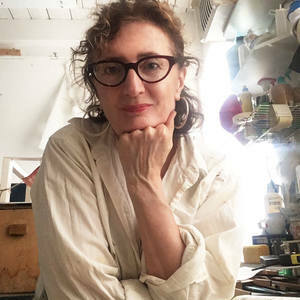 Marian has been the recipient of numerous nominations and awards for her theatre and film design work and as a visual artist has being supported by the Canada Council and the Ontario Arts Council. She was also a Finalist in the prestigious RBC Painting Competition (2001). Her work can has been exhibited across Canada and can be found in private and corporate collections in North America. Nova Scotia College of Art & Design, Halifax, N.S. Nova Scotia Technical College, Halifax, N.S.